The U.K. government has released its Clean Air Strategy. The U.K. REA said it welcomes the ambitions of the strategy, but called on the government to take into account contemporary evidence on the role of bioenergy in meeting carbon targets. 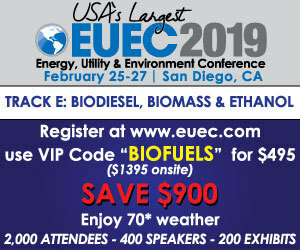 FuelCell Energy Inc. has announced progress with the development of two biogas fuel cell projects in California, including one in Orange County that will convert landfill gas into renewable electricity and hydrogen. The European Commission has approved, under European Union state aid rules, a scheme in Portugal to support biomass energy installations located close to forest areas regarded as critical due to the risk of fires. In Brazil, a waste-to-energy pilot plant that produces biogas and fertilizer was recently installed in the city of Rio de Janeiro. The Rio press office said the plant is located at the municipal company of urban cleaning (Comlurb). Researchers from NREL, PNNL, and ANL have identified an approach to improve the efficiency and reduce costs of biofuel production by demonstrating improvements in bio-oil yield through catalyst and process development. Seneca Resource Recovery recently commenced a three-year contract to supply high-spec biomass fuel to Templeborough Biomass Power Plant in Rotherham. The fuel is manufactured using waste wood recovered from construction and commercial waste.